Who doesn’t love the hilariously-deadpan Jim from the hit TV series, The Office? Since the series ended in 2013, John Krasinski has moved on to a successful career both in front of and behind the camera. His third directorial effort is a bit out of his comfort zone. A Quiet Place (opening next week) is an intense thriller set in the near future after an apocalyptic event. 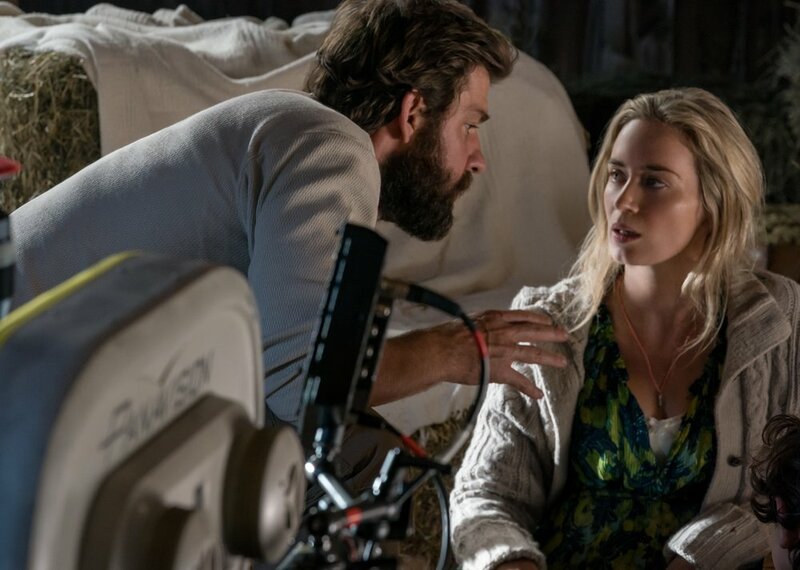 It follows a family of survivors and stars Krasinski, his wife Emily Blunt with Millicent Simmonds (Wonderstruck) and Noah Jupe playing their children. They are terrified, alone and just trying to stay alive remaining totally silent while a trio of sharp-toothed creatures lurk in the distance. Making even the slightest noise is enough to prompt an attack. Original-Cin’s Bonnie Laufer met with writer, director and star John Krasinski in Toronto to talk about the daunting task of working on this film and why he would literally jump through hoops to work with his wife again. OC: This movie is so intense my heart was palpitating from the first few frames. I have to say, being such a blabbermouth there is NO way I’d be able to live in a world where your survival depends on being completely silent. Could you do it? OC: You not only star in and directed the film, but you rewrote the script. It had to have been quite a daunting experience. OC: It worked, you made me cry! JK: (Laughs) “I’m glad! I know it sounds like a tiny bit of advice but it's truly something that I have taken with me through my whole career and especially on a movie like this. OC: The casting of your wife Emily was nothing short of brilliant. OC: She was so believable in this role (as were you), but working together in this capacity, I am guessing that it had a lot to do with the trust factor between the two of you. “We really talked a lot about it. We sat up that night and we talked about what we were really scared of. And the truth is, even though we do the same job, the weird thing about being actors is you never work together. And so, yes, you do the same thing, but you never meet the same people. “She has her own crews that she works with, and so to actually do this all together was phenomenal. The idea that she has her own process and I have my own process - let's hope that they don't clash. “It turned out to be the best collaboration I'd ever had my life truly. She's as smart as you would think. She's as talented as you would think and then some, and she's also the most professional, most positive person every single step of the way. OC: I can’t wait to see her as Mary Poppins. OC: She is going to be a legend to so many young kids as Julie Andrews was to us watching the original film growing up. That’s heavy. OC: The kids that you cast in A Quiet Place are also quite fantastic, but Millicent Simmonds who plays your eldest daughter is extraordinary. When I first saw her in Wonderstruck last year I was blown away by her poise and her performance. She just steals this movie, but for you having a deaf actress was probably not only imperative but I’m guessing that you learned a lot from her through this process. JK: “You nailed it Bonnie. Having a deaf actress play this part was non-negotiable for me. Not only because the performance would be more layered and textured in understanding the world, but I wanted someone to be my guide. I needed someone to help me explore what it is like to be in a family with someone who is deaf, and how they manage in the world that we go through as humans who can hear. She was phenomenal and I just can’t believe how blessed I was to get her. “She helped us all with the sign language, she’s such an incredible spirit, I truly don’t think she is from this world. She is an angel and she’s so nice, so professional and was so kind to all of us about learning sign language and facilitating our communication.